ILMerge generated assembly doesn't run, although log output reports no errors - why is this? I'm testing out ILMerge for a new project, and although the .exe file seems to be created correctly, it won't run. I have installed ILMerge via the .msi installer (found here http://www.microsoft.com/download/en/confirmation.aspx?id=17630) and am running on a test project using a batch file. Below is the batch file, and the subsequent output log after running. All appears ok in the logs, no errors reported. I am running .NET framework 4.0 for this test project. When I try to run the .exe, it fails with a standard "This program has stopped working". I have read that some people have issues running with .NET 4, but I think I've added in the correct arguments to handle this. I get the same result whether I add in the .NET 4 args or not. Can anyone see why this may be? Thanks in advance. Copyright (C) Microsoft Corporation 2004-2006. All rights reserved. Trying to read assembly from the file 'C:\WORKING\DIR\TestILMerge\TestILMerge\bin\Debug\TestILMerge.exe'. There were no errors reported in TestILMerge's metadata. Trying to read assembly from the file 'C:\WORKING\DIR\TestILMerge\TestDLL2\bin\Debug\TestDLL2.dll'. There were no errors reported in TestDLL2's metadata. Trying to read assembly from the file 'C:\WORKING\DIR\TestILMerge\TestDLL3\bin\Debug\TestDLL3.dll'. There were no errors reported in TestDLL3's metadata. Checking to see that all of the input assemblies have a compatible PeKind. All input assemblies have a compatible PeKind value. Using assembly 'TestILMerge' for assembly-level attributes for the target assembly. Merging assembly 'TestILMerge' into target assembly. Merging assembly 'TestDLL2' into target assembly. 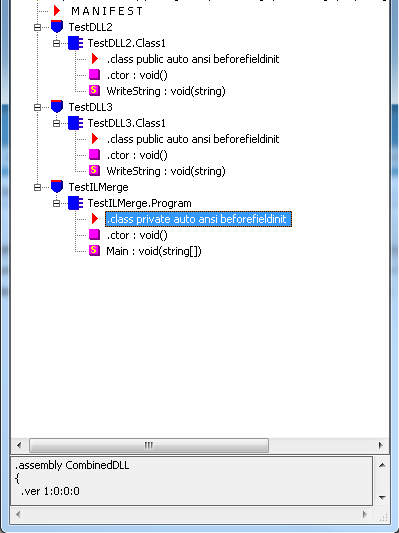 Merging assembly 'TestDLL3' into target assembly. Copying 2 Win32 Resources from assembly 'TestILMerge' into target assembly. Transferring entry point 'TestILMerge.Program.Main(System.String)' from assembly 'TestILMerge' to assembly 'CombinedDLL'. There were no errors reported in the target assembly's metadata. ILMerge: Writing target assembly 'C:\WORKING\DIR\TestILMerge\TestILMerge\bin\Debug\CombinedDLL\CombinedDLL.exe'. There were no errors reported in  mscorlib's metadata. I have found that the component works if I reference from another project and use as an assembly, but not a standalone executable. ILMerge is great if you wrote all of the assemblies that you're trying to merge, and you know that none of them are making assumptions about assembly organization. But under many circumstances (especially ones where heavy reflection or the Dynamic Language Runtime are involved), ILMerge just doesn't work. Sometimes things fail in surprising and mysterious ways. When ILMerge fails, Jeffrey Richter has a more reliable way to get applications with multiple DLL dependencies to be deployable as a single assembly. It isn't without trade-offs, but even the ILMerge author, Mike Barnett, said in the comment thread on that blog post "As the author of ILMerge, I think this is fantastic! If I had known about this, I never would have written ILMerge." If you can use Richter's method, you won't trip over most of the reflection or dynamism traps. Embed all of the third-party assemblies that you depend on in your application's Resources. Register a ResolveEventHandler with the AppDomain.CurrentDomain.AssemblyResolve event. When your handler gets called with an assembly that you stashed in Resources, load the assembly. A fully self-contained executable can be created in Visual Studio 2010 easily, and this method does not require ILMerge at all. After this Visual Studio will auto-create a new class called Resources, which you have to use in your new project. Add the two methods below to Program.cs to make the final application work. Then you have to compile your program with Visual Studio and that's it. Perhaps this will not solve your problem, but I think that it is good to verify, that your ilmerged executable doesn't contain references to merged libraries. You can check this with ILSpy (http://wiki.sharpdevelop.net/ILSpy.ashx) - just disassemble your ilmerged executable and check in the tree what assemblies are in references. ILSpy can also help you to verify that your ilmerged executable contains classes from merged assemblies. Next option could be also to debug assembly bindings when trying to start your ilmerged application (http://msdn.microsoft.com/en-us/library/e74a18c4%28v=VS.100%29.aspx). You could also try to debug ilmerged assembly to find out if application crashes even before calling main function, or perhaps somewhere inside. I think that identifying particular type which cannot be found could help to fix the problem. Check your event viewer for any detailed error messages. Also try changing your platform target to x86 for example. You shouldn't need to specify the .net framework directories on the /lib and /targetplatform command line switches if you specify /targetplatform:v4. After a few hours of fighting with this issue I deleted my project folder and did a fresh pull from git. I tried cleaned and rebuilt my project and it the same issue. I then compared my coworkers project and inside the *\Library\Build*, I was missing the Results folder. After adding the folder \Library\Build\Results my solution built with no errors. Not the answer you're looking for? Browse other questions tagged .net ilmerge or ask your own question. Cannot get Application Instance in generated assembly (Razor Engine)?